Today’s irrigation controllers are driven by data and technology. Contractors who embrace these advancements are seeing the benefits. 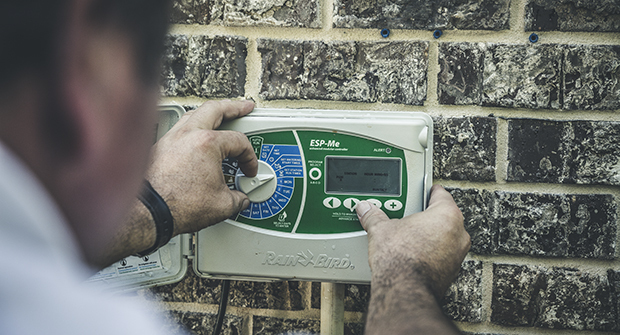 Technology has infiltrated every aspect of modern life, and the irrigation controller is no exception. The devices are more connected and data-driven than ever before, and contractors who are embracing the trends are seeing the advantages these advancements can bring. As Wi-Fi, local area networks and cellular communications become universally affordable and available, consumers are growing accustomed to constant connectivity and instant information. The irrigation system controller is just one more gadget that can now be managed from anywhere with the use of a smartphone or a computer. For landscape professionals, the ability to remotely monitor and manage large numbers of clients is literally money in the bank, says David Shoup, senior product manager for controllers and sensors for Hunter Industries in San Marcos, Calif.
Irrigation experts say contractors benefit from controller connectivity in several ways. The ability to provide remote water management assistance is one potential billing opportunity that can add to a contractor’s revenue stream. Connected controllers also reduce operating costs because many situations that used to require a physical visit to a property can now be handled with a few clicks of a button. These controllers can increase customer satisfaction and retention because the contractor is visibly engaged with the client’s landscape at all times. In fact, a connected contractor can know about a system problem before the customer does. In addition, the reporting capabilities of the more advanced systems allow contractors to not only save water, but also to demonstrate those savings to their customer base, which Shoup says enhances their value to the customers. “These trends are allowing contractors to provide a greater level of service to their customers, while reducing labor costs, water consumption and liabilities associated with improper watering,” says Oster. Robert Brown, owner of Robert Brown Landscape Irrigation in Santee, Calif., says the advancements in controller connectivity have been a “game changer” for his business. The ability to adjust a client’s irrigation system from his phone or computer has decreased the need for on-site visits. Getting alerts about problems, such as a broken pipe or a faulty electrical wire, allows Brown to stay on top of issues before they worsen. Robert Brown Landscape Irrigation is a $200,000 company that provides 90 percent irrigation and 10 percent lighting services to a 75 percent residential, 25 percent commercial clientele. While flow sensors have been around for years, Shoup says sales of these components are increasing in the residential and light commercial markets. He says flow sensors used to be perceived as “rather exotic” accessories, partly because they required expensive communication options to retrieve their information. But with the rise of low-cost internet, the information is now more accessible. Additionally, the availability of intelligent cloud servers can do more with the information, including alerting homeowners and contractors to potentially wasteful situations. Hunter’s newest line of flow sensors includes factory-calibrated and sealed visual dial indicators, in addition to the electronic output, which Shoup says makes the experience more visually reassuring and familiar to homeowners, who are used to these displays in their municipal meters. Oster agrees that water conservation and flow management are growing trends in the irrigation industry. “The data and information being generated by monitoring flow, along with the advanced diagnostic capabilities that continuously monitor a system for leaks, breaks and electrical issues, all help increase system efficiencies and water conservation,” he says. Brown says he is gaining experience with flow sensors as more clients express interest in water conservation. With flow sensors, Brown receives an alert if there is a problem with water flow, and he can quickly reach out to the client to schedule a service call, which he says allows him to take “better, closer care” of his customers. Adapting to all of this new technology can be a challenge for contractors. Oster urges contractors to take advantage of the training and resources provided by manufacturers and distributors to learn how to operate all aspects of these new controllers. “Those not utilizing these capabilities to improve operating efficiency will increasingly be at a competitive disadvantage,” he says. Establishing an internet connection to the controller location is another challenge for some contractors who aren’t familiar with the process. Shoup says the typical household or business wireless router intended to provide connectivity for printers, televisions and other common devices is not typically in the optimum location to connect with an irrigation controller located in a garage or on an external wall. Cellular communications are usually more expensive, and even they can have connectivity challenges, given that an irrigation controller is a fixed object that cannot easily be moved to a spot that receives better coverage. Brown agrees that it’s imperative for the client to have a strong Wi-Fi signal in order for the new controllers to work. He’s had a few instances where he attempted to install a connected controller, but ended up having to go with a traditional version instead. example, manufacturers like Hunter have customer support call centers staffed with networking experts who can help contractors navigate these waters. The company trains and assists contractors with connectivity procedures on an hourly basis at the height of the busy season.